Yesterday, in the supermarket a 17 year-old girl was telling how she has started throwing up her food. The epidemic of people with eating disorders is threatening the psychological and physiological health of so many, young and old. * It's scary, and therefore the shock value of this short clip is warranted in my opinion. 59. Notable Latino Americans by Matt S. Meier, et al. There is something quite delightful in living only minutes away from the beach, (yes, there are beaches in NYC.) Once in a while, even though I'm completely a night owl, I wake up early and hear the birds chirping all the way up through my 26th story windows and smell the salt of the ocean perfumed air, and my soul smiles. Today, it was raining and cloudy, and still the air held the scent of the salty Atlantic water in its tight grasp, beckoning the promise of a summer filled with green, green grasses, and sweaty little boys and girls dancing amongst the sprinklers, and BBQs and laughter. It brings me such joy to see cute little skunks at night, or geese or hearty, tough seagulls on my sprint to catch the bus or walk home. Growing up in Spanish Harlem (read: city girl), the only animal life, I knew were pigeons or strays, so all this still holds charm and novelty for me. Best of all, it renews my sense of hope, in the world, life, the miracle of life, and the ebb and flow of change. How off the chain is this song? "In 1927, Archer M. Huntington, founder of the Hispanic Society of America established an endowment fund in his name, the first of several important donations for Hispanic studies at the Library of Congress. The second "area studies division" to be founded by the Library, in 1939 the Hispanic Division was established to acquire Luso-Hispanic materials in a systematic fashion. In that same year, the division's reading room, The "Hispanic Society Reading Room," named after the New York Hispanic Society of America, was inaugurated to service the Library's growing Luso-Hispanic collections. Although primary emphasis has always been the acquisition of current materials and government documents the Hispanic Division has also acquired a rich collection of rare items. The Division was instrumental in acquiring significant gifts of manuscripts, music scores, and posters, photographs and films. It made efforts to develop special groups of materials such as collecting folk music from San Antonio, Texas, and pioneering the recording of Hispanic poets. Through the generosity of countless donors, the Library of Congress has amassed the world's finest collection on the history and culture of Latin America, Iberia, and the Caribbean." I just read this article and it blew my mind! This would revolutionize our lives! Women might soon be able to produce sperm in a development that could allow lesbian couples to have their own biological daughters, according to a pioneering study published today. A White Paper on genetics suggested that artificial gametes produced from the ordinary "somatic" tissue of the body may be banned from being used to fertilise human eggs by in vitro fertilisation. I wish I didn't have to go to a meeting so I could spend some more time on this site. I just read that Alfonso Cuaron, the director of Children of Men, which I saw last night on DVD, won a 2007 Rave Award. The award is being merited out by Wired Magazine for innovators, instigators, and inventors. So what's a girl to do when sleep fails to come steal her away from her unrelenting thoughts? Write, right? It's hot in my room, even though I have almost every window in my apt. open tonight and I just can't seem to fall asleep. I would write a poem but it seems silly to wear my heart on my sleeve or perhaps on my blog, or so I've come to learn, the hard way of course. Today, when we had the server down at work for a bit, I went outside for a while and sat near the potted hyacinths and would you believe that in the 30 minutes I was out there I got sunburnt? Well, another layer of sunburn, I went to the park yesterday, did 4.5 miles, and came home a glorious lobster red. Of course, eventually it will turn brown of course, olive brown. I feel a bit lost and torn, it feels like a big change is coming, and I feel like a doe in glaring headlights. Do I run or do I stay? Doing nothing is still doing something, so if I'm going to something anyway I better do something that will at least allow me some control over the situation, right? “[Herman] Melville and others entered the canon where traditionally there were only British writers. Then the canon expanded to include African-American writers and more.”Although Hispanic literature isn’t new, it has generally been left out of world literature courses, says Cantú. “Since the 1930s, there were writers being published, not by New York presses but by smaller presses.” she says. Dr. Louis Mendoza, chair of the Chicano studies department at the University of Minnesota, says high schools and universities have a role to play in exposing students to diverse types of literature.“We want kids who are better writers, who are able to express themselves, and when they enter college, it shouldn’t be the first time they have been exposed to this,” he says. “I was 25 the first time I was exposed to Hispanic literature. It changed my life and became my life’s calling. And that was very sad that it happened so late.”Cantú says American literature has evolved and will continue to evolve as writers from different ethnic groups emerge on the literary scene. But she would like to see this shift, for example, reflected on the GRE’s English exam.“There are some African-American writers represented there, but no Chicanos,” she says. The next big leap came with the multicultural movement of the 1980s and ’90s, which prompted colleges and universities to begin recognizing the gaps in their curriculums.In his 2003 nonfiction book, Crossing Into America, Mendoza examines the political event that he says set the stage for the multicultural movement and other social changes. In 1965, the U.S. Congress voted to repeal the immigration restrictions of the 1924 National Origins Act. The federal law had long discriminated against people from Latin America and Asia, giving immigration preference to well-educated and well-funded Europeans. The repeal of the quotas meant Latin Americans and Asians were free to enter the United States in large numbers for the first time.“The coming of those peoples created a layer base of people to produce that body of literature,” Mendoza says.Within the growing body of Hispanic literature is also older work by Hispanic writers, which must be recovered, Mendoza says. He specifically praises the work of Arte Público Press, which has been working to restore the literary history of American Hispanics. Scholars across the country have been helping the Press with the “Recovering the U.S. Hispanic Literary Heritage Project,” uncovering the writings of Hispanic and Latino explorers, settlers and writers since the 1500s.In 2002, the Press published En Otra Voz: Antología de Literatura Espana de Los Estados Unidos (Herencia: The Anthology of Hispanic Literature in the United States, the English-language version, was published by Oxford University Press), the first comprehensive collection of Spanish-language literature from U.S. Hispanics. The entries encompassed plays, poems, journals, fictional excerpts and articles, ranging from contemporary work all the way back to Spanish conquistador Cabeza de Vaca’s account of his journey to the New World. In all, En Otra Voz spans more than 300 years of Hispanic literature and includes writers from all major Hispanic ethnic groups.Cantú and Mendoza both say the reclamation work plays an important role in understanding the cultural identities of Hispanic groups. The early works also add to the body of American literature, they say. The increase in publishing opportunities has also led to a rise in scholarship and teaching opportunities. At UT-San Antonio for instance, a new doctoral program is being offered in Hispanic literature.“It is pretty competitive to gain admission; there is more of a need for people trained in this area,” Cantú says. “Also, as the population of Hispanics and Latinos increase, there is more of a demand for this curriculum and this type of literature.“We are training professors for the next generation. Many are retiring now that were teaching in the late 1960s and early ’70s. The demand for these courses was born from the activism of the Chicano movement,” she continues.But as the programs pop up on more campuses, the universities are wrestling with the question of where to place them. Do Hispanic literature programs belong in the English department or the Spanish department? So far, the answer is as diverse as Hispanic populations in America.The program at UT-San Antonio is housed in the English department, as are the programs at the University of Southern California and the University of Northern Colorado-Greeley. New York University’s top-ranked program offers Latin American literature studies as part of its Latin studies program. And the University of Houston, the home of publisher Arte Público Press, houses its program in the Spanish department.In its early years, Mendoza says the program was often perceived as a regional study. For example, Puerto Rican literature was seen as indigenous to New York, while Mexican literature was seen as indigenous to the Southwest. But as Hispanic groups have spread across the country, such regional designations no longer apply. Mendoza is also quick to point out that the Hispanic community long predates the establishment of state, or in fact national, borders.Hispanic literature programs have expanded in recent years, now encompassing works by artists from the Caribbean, the Dominican Republic and Puerto Rico. And Cantú says the interest isn’t limited to states with large Hispanic populations, such as California, Florida, New York and Texas. She taught the subject at the University of Nebraska.Interest doesn’t stop in the United States. Cantú says programs have found a niche in Europe. Hispanic literature conferences have been held in Holland, Spain, Turkey and even Siberia, she says.“One of the reasons it is so interesting for them is because we represent ‘mestizaje,’ as different cultures coming together.The same thing is happening for them in the European Union,” she says. “It’s good for writers to see us, all writers, not just Hispanics and Latinos. I do readings across the country, and I can tell you there’s a hunger for our work and our words, and not just among students of color.”A Sampler of Hispanic LiteratureHispanic American literature, unlike Latin literature, focuses on life in the United States and is typically written in English, as told from the perspective of a specific Hispanic culture. A sampling of writers who have contributed to this canon include Chicano American writers Rudolfo Anaya (Bless Me, Ultima), Sandra Cisneros (The House on Mango Street), Tomás Rivera (And the Earth Did Not Devour Him) and poets Jimmy Santiago Baca, Loma Dee Cervantes and Leroy V. Quintana. Writers with Caribbean backgrounds include Puerto Ricans Judith Ortiz Cofer (The Line of the Sun) and Ed Vega (Casualty Report), and poets Victor Hernandez Cruz, Miguel Algarin, and Sandra Maria Estevez. Cuban-American writers include Roberto G. Fernandez (Raining Backwards), Cristina Garcia (Dreaming in Cuban) and Oscar Hijuelos (The Mambo Kings Play Songs of Love). Poets include Gustavo Perez Firmat, Ricardo Pau-Llosa, and Carolina Hospital. Julia Alvarez (How the Garcia Girls Lost Their Accents) writes from a Dominican-American perspective. Other writers include Colombian-American Jaime Manrique (Twilight at the Equator) and Guatemalan-American and Jewish-American Francisco Goldman (The Long Night of the White Chickens). Make this Summer a Literary One! Fostering a love of reading and its rewards, the Barnes & Noble Summer Reading Program is popular with both students in the first through sixth grades and educators throughout America. Last summer, we provided 190,000 free books and participants read 2.3 million books! This year, children can join Jack and Annie from Mary Pope Osbourne’s Magic Tree House on their summer adventure as part of their own journey in our Summer Reading program. Participation is fun and easy for kids to earn free books! They simply read any eight books — library books, books borrowed from friends or books bought at Barnes & Noble — write about their favorite part, and bring a completed Summer Reading in the Magic Tree House Journal tear page to a Barnes & Noble bookstore. Children can then choose from a list of paperback books. We’re confident there will be plenty of titles they will like. No matter where your child spends their summer vacation, reading has the ability to take them far, far away — and it can even earn them a free book! Information kits are available at your local Barnes & Noble store, or simply print out the documents below. I don't have many because my new camera needs a mem. card, lol! 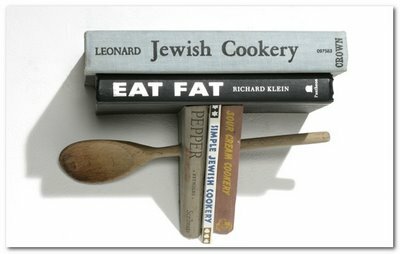 But this is the cutest, most apropo shelf for cookbooks I have ever seen! It would look great in my kitchen! So, I got back from the San Francisco Web 2.0 expo last night to a gray-skied, cold, rainy NYC. I had an awesome time at the expo, my team and I became tighter than ever, bloggers became actual people and I gathered enough material to fill, not a weekly report but an actual book. Anyway, I have tons of work and email to catch up. I will post pics later! So I'm off this weekend to San Francisco for the big Web2.0 Expo. to claim your own safe refuge. tell me to stay away. trying to materialize new life. The evolution of the soul. everyday so that you may drink. who peers out from within. and refuel your tired body. your feet with my grace. but do not over do it. I will wait outside your door. He who leaves always returns. It is the Tao of the universe. Matter can never be destroyed. May Buddha hold you in his path. May you journey in a circle. UT associate journalism professor Maggie Rivas-Rodriguez has worked on the U.S. Latino and Latina World War II Oral History Project for the past eight years, and has recently submitted a proposal to revise the upcoming PBS documentary, titled "The War," to include the efforts of the U.S. Latino and Latina population. When UT associate journalism professor Maggie Rivas-Rodriguez caught wind that Latinos would be omitted from an upcoming World War II documentary, she reverted to her days as a journalist and followed the lead. In the months that followed, Rivas-Rodriguez was at the forefront of public pressure to get documentary filmmaker Ken Burns and the Public Broadcasting Service to revise the film before it airs in September. PBS is expected to announce its decision today. "This film is supposed to be about World War II, which is something that the entire country was affected by, and there are no Latinos included in this film, and there is nothing about the Latino experience in it," Rivas-Rodriguez said. For eight years, Rivas-Rodriguez has been the director of the U.S. Latino and Latina World War II Oral History Project, documenting the experience of approximately 550 Latino and Latina veterans. She said she often offers access to the archives for use in history exhibits that do not include Latinos. "We say that the war touched every family on every street in every town in America, and that was true," Burns said during a Tuesday morning radio interview on Cleveland's National Public Radio affiliate, WCPN-FM. "So we knew that any towns we picked could stand in for any towns." He was responding to previously recorded comments from Rivas-Rodriguez. The 14-hour documentary, simply titled "The War," is an anecdotal mix of archival war footage and testimony from locals in four U.S. cities: Waterbury, Conn.; Mobile, Ala.; Sacramento, Calif.; and Luverne, Minn. Burns said the majority of the film's footage is of battle and the bulk of testimony comes from approximately 10 veterans. Rivas-Rodriguez and four others established the Defend the Honor campaign, asking PBS and Burns to revise the documentary and include the experiences of Latino veterans. PBS and Burns have maintained that the documentary was completed more than a year ago and that the structure of the documentary was not meant to be comprehensive. Burns said he did devote attention to black veterans and Japanese-Americans in his film, citing their contributions or circumstances. An estimated 500,000 Latinos served in the armed forces during World War II. Defending the film, Burns cited census numbers from the 1940s, which report Hispanics as 1.4 percent of the U.S. population. The accuracy of census numbers from that era can be discerned from the discharge papers for Latino veterans, present in the archives of the oral history project. Many of the discharge papers in the project's archives list Latinos as white, Rivas-Rodriguez said. "We have men who came back after earning the Medal of Honor, and they were turned away from restaurants. This was an everyday occurrence for Latinos across the country," Rivas-Rodriguez said. "For our story to be left out of the national collective memory one more time is unacceptable." Is Your Book Addiction Running You Dry? If you're like me your "little" book fetish is both emptying your wallet and filling up your wall space. Well, I recently read about a service that works like Netflix, you pay under $10/mth and they send you unlimited rented books and a prepaid mailer to return them. This evening I had an "ah-hah" moment, as corny as that may sound. It hit me that with great clarity that people will love you, people will hate you. They might even love you AND hate you, but ultimately those feelings are just a symbol of your power and your greatness. Your divinity, that which we have no power over. That which just is! It's free, from MIT and online, how better to get in touch with the literary greats in your alma lingua? service the Library's growing Luso-Hispanic collections. Antonio, Texas, and pioneering the recording of Hispanic poets. For most college students, literature courses began in high school and consisted almost entirely of the classics of America and Western Europe. But English professor Norma E. Cantú says the emergence of Hispanic literature and its growing popularity on college campuses around the country — and the world — is proof that American literature is expanding and making room for the diverse cultures that make up this country. Although Hispanic literature isn’t new, it has generally been left out of world literature courses, says Cantú. “Since the 1930s, there were writers being published, not by New York presses but by smaller presses.” she says. Dr. Louis Mendoza, chair of the Chicano studies department at the University of Minnesota, says high schools and universities have a role to play in exposing students to diverse types of literature. Cantú says American literature has evolved and will continue to evolve as writers from different ethnic groups emerge on the literary scene. But she would like to see this shift, for example, reflected on the GRE’s English exam. A Long Time ComingCantú says the civil rights movement helped bring new styles of literature into the mainstream, pointing to the current popularity of East Indian, Iranian and Vietnamese writers as examples. But, she says, it was Black and Hispanic writers who opened the door for the others. The next big leap came with the multicultural movement of the 1980s and ’90s, which prompted colleges and universities to begin recognizing the gaps in their curriculum. In his 2003 nonfiction book, Crossing Into America, Mendoza examines the political event that he says set the stage for the multicultural movement and other social changes. In 1965, the U.S. Congress voted to repeal the immigration restrictions of the 1924 National Origins Act. The federal law had long discriminated against people from Latin America and Asia, giving immigration preference to well-educated and well-funded Europeans. The repeal of the quotas meant Latin Americans and Asians were free to enter the United States in large numbers for the first time. “The coming of those peoples created a layer base of people to produce that body of literature,” Mendoza says. Within the growing body of Hispanic literature is also older work by Hispanic writers, which must be recovered, Mendoza says. He specifically praises the work of Arte Público Press, which has been working to restore the literary history of American Hispanics. Scholars across the country have been helping the Press with the “Recovering the U.S. Hispanic Literary Heritage Project,” uncovering the writings of Hispanic and Latino explorers, settlers and writers since the 1500s. In 2002, the Press published En Otra Voz: Antología de Literatura Espana de Los Estados Unidos (Herencia: The Anthology of Hispanic Literature in the United States, the English-language version, was published by Oxford University Press), the first comprehensive collection of Spanish-language literature from U.S. Hispanics. The entries encompassed plays, poems, journals, fictional excerpts and articles, ranging from contemporary work all the way back to Spanish conquistador Cabeza de Vaca’s account of his journey to the New World. In all, En Otra Voz spans more than 300 years of Hispanic literature and includes writers from all major Hispanic ethnic groups. Cantú and Mendoza both say the reclamation work plays an important role in understanding the cultural identities of Hispanic groups. The early works also add to the body of American literature, they say. The novels went unpublished possibly because publishers were uninterested or unconvinced of the books’ potential financial success, Mendoza says. Today, the majority of Hispanic literature is published by independent presses, though there has been some increase in interest among the mainstream presses in recent years. But as Hispanics solidify their position as the largest minority group in the country, some wonder whether large publishing companies are increasing their Hispanic literature proportionally. The increase in publishing opportunities has also led to a rise in scholarship and teaching opportunities. At UT-San Antonio for instance, a new doctoral program is being offered in Hispanic literature. “It is pretty competitive to gain admission; there is more of a need for people trained in this area,” Cantú says. “Also, as the population of Hispanics and Latinos increase, there is more of a demand for this curriculum and this type of literature. “We are training professors for the next generation. Many are retiring now that were teaching in the late 1960s and early ’70s. The demand for these courses was born from the activism of the Chicano movement,” she continues. But as the programs pop up on more campuses, the universities are wrestling with the question of where to place them. Do Hispanic literature programs belong in the English department or the Spanish department? So far, the answer is as diverse as Hispanic populations in America. The program at UT-San Antonio is housed in the English department, as are the programs at the University of Southern California and the University of Northern Colorado-Greeley. New York University’s top-ranked program offers Latin American literature studies as part of its Latin studies program. And the University of Houston, the home of publisher Arte Público Press, houses its program in the Spanish department. In its early years, Mendoza says the program was often perceived as a regional study. For example, Puerto Rican literature was seen as indigenous to New York, while Mexican literature was seen as indigenous to the Southwest. But as Hispanic groups have spread across the country, such regional designations no longer apply. Mendoza is also quick to point out that the Hispanic community long predates the establishment of state, or in fact national, borders. Hispanic literature programs have expanded in recent years, now encompassing works by artists from the Caribbean, the Dominican Republic and Puerto Rico. And Cantú says the interest isn’t limited to states with large Hispanic populations, such as California, Florida, New York and Texas. She taught the subject at the University of Nebraska. Interest doesn’t stop in the United States. Cantú says programs have found a niche in Europe. Hispanic literature conferences have been held in Holland, Spain, Turkey and even Siberia, she says. “One of the reasons it is so interesting for them is because we represent ‘mestizaje,’ as different cultures coming together. Hispanic American literature, unlike Latin literature, focuses on life in the United States and is typically written in English, as told from the perspective of a specific Hispanic culture. A sampling of writers who have contributed to this canon include Chicano American writers Rudolfo Anaya (Bless Me, Ultima), Sandra Cisneros (The House on Mango Street), Tomás Rivera (And the Earth Did Not Devour Him) and poets Jimmy Santiago Baca, Loma Dee Cervantes and Leroy V. Quintana. Writers with Caribbean backgrounds include Puerto Ricans Judith Ortiz Cofer (The Line of the Sun) and Ed Vega (Casualty Report), and poets Victor Hernandez Cruz, Miguel Algarin, and Sandra Maria Estevez. Cuban-American writers include Roberto G. Fernandez (Raining Backwards), Cristina Garcia (Dreaming in Cuban) and Oscar Hijuelos (The Mambo Kings Play Songs of Love). Poets include Gustavo Perez Firmat, Ricardo Pau-Llosa, and Carolina Hospital. Julia Alvarez (How the Garcia Girls Lost Their Accents) writes from a Dominican-American perspective. Other writers include Colombian-American Jaime Manrique (Twilight at the Equator) and Guatemalan-American and Jewish-American Francisco Goldman (The Long Night of the White Chickens). But Don't All Blacks Grow up to be Athletes & Hispanics Maids and Gardeners? Flip through the textbooks used by every Palm Beach County Algebra I student and take a look at the faces in the pictures.Forest Hill High School resource teacher Karen Cook did that. What she found among the lessons on graphing linear equations and calculating slope was what she calls a hidden curriculum. Most of the photos were of white men or women. And when a black man was shown, chances are he was throwing a football or swinging a golf club instead of sitting behind a desk. The images or lack thereof send a subliminal message to students, said Cook, who reviewed district-approved Algebra I texts as part of her doctoral study at Florida Atlantic University. "Our textbooks are basically the window to our society in that classroom," she said. "If our textbooks are not reflecting opportunity and diversity in society, then I wonder how it's affecting our students and how they perceive our society." Cook took on the textbook study last year as a project for a six-week summer course called race, class and gender issues in education. Her results were based on a small sample, the two district-approved Algebra I books. She chose math books because previous research on racial representation focused primarily on social science textbooks. She zeroed in on Algebra I because it is a required course for Palm Beach County students. Cook's findings sparked a lively discussion in class at FAU. Next week, she's headed to Chicago to present the results at a conference sponsored by the American Education Research Association. Committees selecting textbooks must consider "multicultural fairness and advocacy," under state and district policy. But the state evaluators' handbook warns not to draw conclusions from a simple tally of people in photos or illustrations by race, as Cook did. It is "the substance of what is stated and portrayed that matters most," the handbook reads. District committees choosing which books to buy from the state-approved list look for racial balance, but the top priority is content, said Meezie Pierce, the district's director of instructional materials. "That's what the students are going to see and learn from." Cook admits her methodology was not an exact science. She used her own judgment to determine a person's race. Often it wasn't obvious. When she couldn't tell, she listed it as unknown. In the books published by McGraw-Hill and Prentice Hall in 2004, Cook found a total of 276 white people, 44 blacks, 30 Hispanics and 30 undetermined. Cook would not provide a copy of her research to the publishing companies. Without seeing the study, Mary Skafidas, spokeswoman for McGraw-Hill Education, could not comment on its accuracy. The company considered state standards and the input of educators across the country when writing the book, she said. "The images in our materials are designed to enhance learning by helping students understand and relate to the diverse world in which we live," she said. No one from Prentice Hall responded to requests for comment. A casual leafing through either book likely won't spark any calls of injustice. But in a school district where only 35 percent of students classify themselves as white, most Palm Beach County students would find relatively few faces resembling their own. "It isn't really blatant until you sit down and take a look at it," Cook said. A page on the Census in the McGraw-Hill book contains an array of photos of people of various racial and ethnic backgrounds. It includes photos of a black pilot and a black teacher. But there is also a heavy dose of minority sports figures. Golfer Tiger Woods, baseball player Alex Rodriguez, basketball player Kobe Bryant and Miami Dolphins quarterback Daunte Culpepper are featured. Cook hopes to expand her study of textbooks to other subjects. "This is just meant to (start) a discussion," she said. Free Book Offer for Kids! You have just entered the Indiana Pacers' Locker Room Library, where you can receive a free book! The goal of Locker Room Library is to provide children the opportunity to establish their own home libraries and to embrace the love of reading. Check out the hundreds of books available at Locker Room Library and select your top three favorites (quantities of some titles are limited and therefore subject to availability). Once you select your favorites, simply click on this link and print out the form. Make sure to complete the form in its entirety and let us know your top three favorite books available at our library. Your free book will be mailed to you within 4-6 weeks of receiving your Request Form. Remember, you will only receive one book per Request Form, but you can submit as many Request Forms as you want! We hope you enjoy your visit to the Pacers' Locker Room Library and return often! Locker Room Library is part of the Pacers Read to Achieve program presented by Chase. This is a great offer, enjoy! And their sense of entitlement! A young guy on the elevator this morning came in attempting to hold three drinks, one a large coffee, all at once and stood behind me. Shortly after the elevator began its rise toward my umpteenth floor the man lost control of his drinks, spilled his coffee and somehow managed to lose the lid. He said, "sorry" to the young man standing near him who picked up the coffee lid for him and nothing else. He did however seemed quite chagrined. I looked down at my white, boucle coat and saw nothing but my instinct told me that some MUST have gotten on me. When I reached my office, I quickly took my coat off and saw a splatter of cafe au lait stains plus the little white bag I was carrying my books in was completely drenched! I was able to scrub the stains off of my coat, which needed dry cleaning anyway but what really irritated me is that that man said absolutely nothing to me. Had that been me, I would've apologized profusely and offered to pay the dry cleaning expenses, because that is what you do, the right and proper thing to do, right? Make the world a better place, right? I don't understand people, is it really an "out for self" world? If it is...that just leaves a sour taste in my mouth! “Layers of cloudy inter-relatedness and vague hints of consequence create an intriguing puzzle — one that simultaneously begs to be deciphered and defies that process.”ReviewMany novels succeed by virtue of their authors' abilities to take a single event or moment and parse it into individual elements: background information, subtle details, motivations, consequences. The reader, in this model, is taken from a point of relative confusion to a point of clarity. This is a time-tested formula, but there are writers capable of succeeding by following a model that runs contrary to this one.César Aira's How I Became a Nun starts with a small but not insignificant event: the day the narrator's father delivers on a long-standing promise to treat her (or him — Aira changes the child's gender every few pages) to an ice-cream cone. But the child hates the taste so much that she ends up sobbing violently at the thought of another mouthful. To reveal what happens next would spoil the tragic story, but it changes the child's life.The beauty of this slim book (only 117 pages) lies in the fact that the author doesn't, as might be expected, demonstrate precisely how and why this event alters the child's life. intentionally stops short of tying everything together into a linear, cause-and-effect narrative. In Aira's world, we move from a relatively simple state of confusion, one that urges us onward, to a wholly complex one. I threw out a 2-foot stack of unread magazines, because I just don't have the time to read them anymore. I kept about 12-15 though and placed them in my cool PVC magazine holder that cost me all of $4.99 at the .99 store. I washed my hair, did my nails and then slowly went through my jeans, and found the lost pair amongst my sweaters. How it got into my sweaters, I will never know. Then I did my jewelry, I found a couple of earrings I thought had left to the lost playground but sadly not my diamond earring! Today I feel so fresh and so clean, clean! "I hate to lose something,"then she bent her head"even a dime, I wish I was dead. I can't explain it. No more to be said. Cept I hate to lose something." "I lost a doll once and cried for a week. She could open her eyes, and do all but speak. I believe she was took, by some doll-snatching-sneak I tell you, I hate to lose something." "A watch of mine once, got up and walked away. It had twelve numbers on it and for the time of day. I'll never forget it and all I can say Is I really hate to lose something." "Now if I felt that way bout a watch and a toy, What you think I feel bout my lover-boy? I ain't threatening you madam, but he is my evening's joy. And I mean I really hate to lose something." So lately I've become a loser, as in one who loses things. I never use to lose things, 1. because I am super careful with my things and 2. because it was easy to keep track of such few treasures but now... I've adapted this carefulness since I was a small child. I once lost a family of three bears and cried so much my poor mom took me back outside where we backtracked through all the stores we had been to that day and I won the hearts of many a store owner who promised to keep an eye out for three bears. I had a favorite book, a gift from my sister called the Lost Playground. I loved this book because the main character, a homemade stuffed animal, had a bizarre long name, Theodore something something which I can't quite recall and also because I could relate to his owner's loss. The idea of a lost playground where lost items and toys lived in a happy limbo between worlds was scary to me. I wanted to cry, to cry the way Owl at Home cried in order to make his "teardrop tea." Anyhow, lately I've lost single earring after single earring, and this morning I couldn't find the jeans I wanted to wear. Somehow my house has become a place where things just strangely disappear. I just don't understand it, because I'm very neat and always return things to the same place. My jewelry boxes and walk-in closet are meticulous. I just find this so odd and upsetting. I've begun losing things that have so much sentimental value, a diamond stud earring from the pair my boyfriend bought me for Xmas a couple of years back, the $200 bracelet he bought me for my birthday, one cute cheapy companion earring to about 3 pairs of earrings now maybe even 4. I cried for hours over the bracelet, and I'm still in denial over the diamond earring, I keep thinking, "No, it must be somewhere..."
I'm not sure if some one is playing tricks on me, since my BF's old Bulova also mysteriously disappeared or if maybe I'm just getting careless. Anyhow, lost things just break my heart, they had a home, you know?